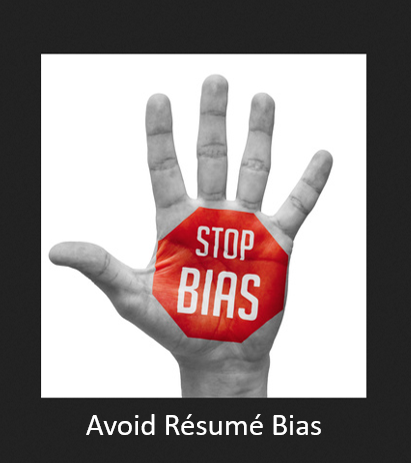 The other day, I listened to a podcast from my friend Chris Russell and his guest, Pete Radloff about Resume Bias. Pete is a Recruiter and had written an article on Resume Bias which resulted in the podcast. You can listen to it here (click here). Here’s what I loved about the podcast. It was brave and honest. Most of us in this world of resume screening, writing, hiring, recruiting and sourcing sees hundreds if not thousands of resumes and when you do that, you can tell a stinker a mile away. I guess I am not supposed to say that because some potential clients may get their feelings hurt and label me insensitive but the truth is out of 100 resumes, 95 of them are bad. And again, if you are looking at them all day you can tell a bad resume just by the font on the heading! Or by the size of the name, the format or template, the way the information is presented visually, and the wording (if you decide to read it). The truth is we all have bias – subconsciously, unconsciously, indirectly, however you want to say it, but we all have it. We make judgements based on your resume. Your resume can help you get the next big job or it can cause you to lose out on a job. Here is a true story that just happened to a client of mine. The client has past Director experience, but recently overlooked for several Director positions. The problem was the resume was 3 pages and the first page and a half highlighted the non-director experience. Also, the heading was very boring and mundane. We updated the heading and highlighted the Director level experience in Career Profile to position their revelant experience quicker and it worked. If the first half of your resume is not attractive, meaning the font, the arrangement, the words and the format are not modern and current, then you could be costing yourself opportunities. All resume aren’t created equal, meaning if you are a talented individual with education and skills but your resume is a template or some old document you wrote years ago, then it does not reflect what you truly are and what’s happening in the world today. Consider this, most hiring managers and decision makers are in their 30s and 40s (most not, not all) so they definitely are open to creativity and design, a little swag as they say. Resumes are still important so why send out bad resume for something so important as your career? Now to address some other areas of bias, most people write their own resumes, so they don’t know what should go on a resume and what should not. For instance, you should not have any unnecessary dates on your resume – any date that can cause someone to guess your age, should not be listed. Political Affiliations and Memberships. I know you are proud of your memberships and associations but know that some can cost you a job so any group that identities your race, religion, and sexual orientation could cause bias or discrimination depending on the company. Too much education. Yes, too much education. If you have multiple degrees then you have to be careful of the jobs you apply for because you be over qualified thus causing the reader to wonder about your true intentions, like why are you applying for positions that you are overqualified for? Or they may wonder if they hire you, will you stick around? Many of these things can be avoided or addressed in your resume and cover letter. If your resume is not netting the results you want, contact me, let’s get you updated.